Soundgarden singer Chris Cornell died suddenly Wednesday night following a performance with the Seattle band at The Fox Theatre in Detroit, MI; he was 52. NBC News reports the circumstances surrounding Cornell's death were not immediately clear but his spokesman Brian Bumbery confirmed the news. "His wife Vicky and family were shocked to learn of his sudden and unexpected passing,” Bumbery told NBC News in an email, “and they will be working closely with the medical examiner to determine the cause. Cornell’s sudden passing comes during Soundgarden’s spring tour of North America, which began last month with three festival appearances in Florida before officially launching in Atlanta, GA on May 3. Cornell co-founded Soundgarden with lead guitarist Kim Thayil and bassist Hiro Yamamoto in Seattle in 1984; longtime members Ben Shepherd and drummer Matt Cameron would cement the lineup after a few changes within the rhythm section. The group signed with Sub Pop Records and released two EP’s – 1987’s “Screaming Life” and 1988’s “Fopp” – before hooking up with SST records and issuing their album debut, “Ultramega OK”, in 1988. The band’s fifth record, 1996’s “Down On The Upside”, was followed by an extended hiatus that lasted until their live return in 2010 and final studio album, “King Animal”, in 2012. 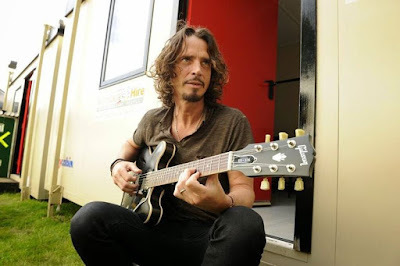 Cornell was also part of the Seattle supergroup Temple Of The Dog alongside members of Pearl Jam; the band's 1991 debut earned US platinum for sales of more than 1 million copies. Cornell released four records as a solo artist and enjoyed a long history of film and soundtrack work. The singer earned a 2008 Grammy nomination for “You Know My Name” – the theme song for the 2006 James Bond flick “Casino Royale” – and a 2012 Golden Globes nomination for “The Keeper” from the “Machine Gun Preacher” soundtrack. The rocker had recently released a new single “The Promise”, the title song to the new feature film of the same name starring Christian Bale, Oscar Isaac and Charlotte Le Bon, set in a love triangle drama set against the 1914 Armenian genocide.